The subscription-based model in grocery and daily essentials has been considered as unscalable business. Right from delivering milk to other daily needs items such as bread, eggs, and others subscription-driven models fill the broken links in fulfilling never-ending household needs. After Mikbasket, Dailyninja and Supr daily, deep-pocketed online grocery platform BigBasket is looking to tap the offline and subscription-based model soon. Besides subscription model which is being dominated by aforementioned players including Satvakart, RainCan, and several others, the Bengaluru-based firm will also install kiosks that will stock daily groceries, fast-moving consumer goods, fruits, and vegetables. According to TOI report, these kiosks will be installed across various apartments and office complexes.The Hari Menon-led firm has already piloted for the new service with a separate app called BB Instant. The items can be bought via BB Instant mobile app. In future BigBasket eyes such thousands of machines to deliver daily needs products to push overall sales(online/offline). The development comes on the back of BigBasket funding from China’s e-commerce major Alibaba, which put in $300 million Series E round in the e-grocer. Last month, the Chinese investment giant also hinted to integrate its portfolio companies such as BigBasket, Paytm Mall, and Pune-based logistics firm Xpressbees to jointly compete with e-commerce behemoth Flipkart and Amazon India who had made entry into e-grocery. Apart from retaining the customers through essential needs, the subscription and offline kiosks will increase the frequency of visits and purchases on the platform. At present, on an average, an engaged user purchases thrice a month on BigBasket. The average ticket size of orders on the platform is about Rs 1,400-1,500. Additionally, it is clocking monthly sales of about Rs 200 crore, which the company is looking to ramp up to Rs 300 crore over the next six months. 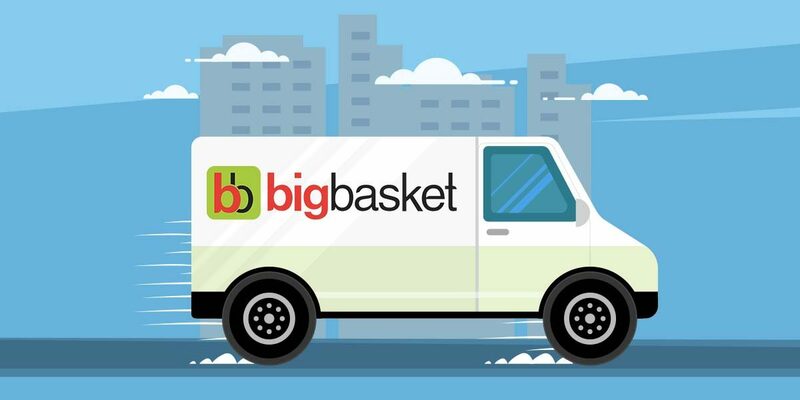 With an inventory-based model, BigBasket competes with established players like Grofers and in future will face tough fights from e-commerce giants Flipkart’s Supermart and Amazon’s food retail in India. Apart from the two biggies upcoming entities in grocery such as Quikr and Paytm will also add more competition in the segment. Paytm and Flipkart had proved unsuccessful in past as they had to shut down e-grocery platforms soon after their launch. Snapdeal-backed PepperTap and Localbanya also faced the similar fate. Delivery of grocery has been the toughest model to crack for startups due to high costs of fulfillment, lower margins, and highly perishable inventory. The issues have been tried to address by the aforementioned subscription-based models. Despite heavy investments, the service has been limited to certain pin codes and cities. It will be interesting to see how heavily funded BigBasket will outperform Milkbasket, Supr Daily, and others.